The oil sands are located in Alberta, but they cover a little part of Saskatchewan as well. 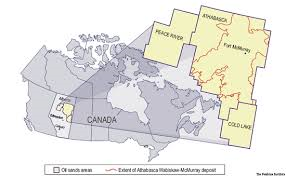 Canada wants to increase oil development from 2 million barrels per day to 4 million barrels per day, so they can make more money to buy resources with to provide for other needs in Canada. The oil sands produce a lot of damage to Canada's environment. The oil leaks on to bodies of waters called tailing ponds, and when birds land in those bodies of water, they also get covered in oil. This makes it hard for them to fly, and cleaning them is a long process. These tailing ponds are filled with arsenic and mercury, and when they leak, they go into our drinking water as well. Therefore this is a health concern, and environmental damage. I think Canada should continue to increase development of the oil sands. Firstly, increasing development of oil sands will increase job opportunities. Since Canada has a huge population, this will be a good way to provide jobs for that population. Secondly, this helps us as a way of transportation. Without oil, Canada's population will not have a proper form of transportation other then walking, because this oil allows us to use cars, which is much faster than walking. In conclusion, I think Canada should continue to increase development of the oil sands because it provides jobs, and helps us as a form of transportation.